NOAA dates back to 1807. 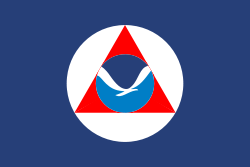 The first scientific agency for the US, the Survey of the Coast, was the precursor to this group and now the NOAA maintains a presence in every state and is an international leader on scientific and environmental matters. The NOAA is a division of the Department of Commerce and its Under Secretary is appointed by the President of the US (with approval from Congress). Serious scientists with government funding claiming that merpeople did not exist would be something to sit up and take notice of. They did not, however, say they didn’t exist. They said there was no evidence they existed. There might be a different opinion here in Canada. While no biological evidence has surfaced to support mermaids here, there are several interesting other pieces to consider. Mermaids (called yawkyawks in Australia) first appeared in stories in Assyria, about 1000 BC. Atargatis was a goddess who loved a mortal shepherd and in the process killed him. Ashamed, she jumped into a lake to take the form of a fish. , but the waters would not conceal her divine beauty. Thereafter, she took the form of a mermaid - human above the waist, fish below. The Greek philosopher Anaximander proposed that mankind had sprung from an aquatic species of animal. This idea reappeared as the Aquatic ape hypothesis in the twentieth century. A popular Greek legend has Alexander the Great's sister, Thessalonike, turn into a mermaid after she died and when sailors would encounter her, she would ask them only one question: "Is Alexander the king alive? ", to which the correct answer would be "He lives and still rules". Any other answer enraged her and she transformed into a Gorgon and doomed for the ships and every sailor onboard. The Arabian Nights (One Thousand and One Nights) includes several tales featuring "Sea People", anatomically identical to land-bound humans, differing only in their ability to breathe and live underwater. Other Arabian Nights tales deal with lost ancient technologies, advanced ancient civilizations that went astray, and catastrophes which overwhelmed them, very much like Atlantis stories. In some of these stories, following the mermaids' beautiful voices leads to confusion and often death. Mermaids were noted in British folklore as well. They were thought to fortell (and often provoke) disaster. 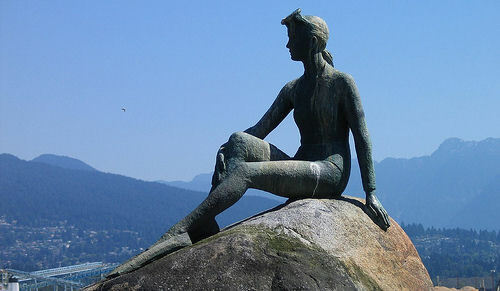 The ballad of Sir Patrick Spens depicts a mermaid speaking to doomed ships; in some versions, she tells them they will never see land again, and in others, she claims they are near shore. They can also be a sign of rough weather. Mermen were also noted as wilder and uglier than mermaids, but they were described as having little interest in humans. Some mermaids were described as up to 2000 feet long/tall. They could also swim up rivers to freshwater lakes. One story is that Laird of Lorntie saw a woman drowning, and went to aid her but a servant of his pulled him back, warning that it was a mermaid. The mermaid screamed after that she would have killed him if it were not for his servant. On other occasions, mermaids could be more beneficent, giving humans means of cure. In some ancient Chinese fairytales the mermaid is a special species can knit beautiful translucent material and whose tears can turn into priceless pearls. Fishermen longed to catch them, but a mermaids' singing can drag them to coma. Fishermen who want to catch mermaids are a symbol of negative character. Examples from other cultures are the Mami Wata of West and Central Africa, the Jengu of Cameroon, the Merrow of Ireland and Scotland, the Rusalkas of Russia and Ukraine, the Iara from Brazil and the Greek Oceanids, Nereids, and Naiads. The mermaid, or syrenka, has been the symbol of Warsaw in Poland since the middle of the 14th century. Several legends associate Triton of mythology with the city, which may have been where the association with mermaids originated. Among the Neo-Ta’no nations of the Caribbean the mermaid is called Aycayia. A freshwater mermaid-like creature from Europe is Melusine, who is sometimes depicted with two fish tails, or the lower body of a serpent. Mermaids and mermen are also characters of Philippine folklore, locally known as sirena and siyokoy. The Javanese believe that the southern beach in Java is a home of Javanese mermaid queen Nyi Roro Kidul. There are two Canadian reports from the area of Vancouver and Victoria, one from sometime between 1870 and 1890, the other from 1967. A late 19th Century newspaper described how three local men in the Point Gray, BC area (where the University of BC is now) went out fishing with an native guide. They reportedly saw a mermaid with yellow hair and brown skin rise her upper body above the surface of the water, very close to their boat, and stare at them. The guide was quite upset by the sighting and told the men that it was a bad omen. In 1967, BC Ferry passengers saw what they claimed to be a mermaid sitting on rocks at the entrance to Active Pass, Victoria, BC. Reports indicated that the mermaid had long blonde hair, the lower body of a porpoise and was sitting on the rocks eating a salmon. Photos taken by a man in an aircraft support the ferry passengers' description. The Victoria Times-Colonist reported the sighting and printed the photo. I have not been able to locate this photo. A long time ago there was an Indian, with his wife and two daughters. They lived by a great lake, or the sea, and the mother told her girls never to go into the water there, for that, if they did, something would happen to them. The father went to seek them. He saw them swimming far out, and called to them. The girls swam up to the sand, but could get no further. Their father asked them why they could not. They cried that they had grown to be so heavy that it was impossible. They were all slimy; they grew to be snakes from below the waist. After sinking a few times in this strange slime they became very handsome, with long black hair and large, bright black eyes, with silver bands on their neck and arms. It will be none the worse for you. We shall carry it along! And so it was: when their parents went in the canoe, the girls carried it safely on everywhere. One day some Indians saw the girls' clothes on the beach, and so looked out for the wearers. They found them in the water, and pursued them, and tried to capture them, but they were so slimy that it was impossible to take them, till one, catching hold of a mermaid by her long black hair, cut it off. Then the girl began to rock the canoe, and threatened to upset it unless her hair was given to her again. The fellow who had played the trick at first refused, but as the mermaids, or snake-maids, promised that they should all be drowned unless this was done, the locks were restored. And the next day they were heard singing and were seen, and on her who had lost her hair it was all growing as long as ever. On January 9, 1493, Italian explorer Christopher Columbus sailed near the Dominican Republic and saw three "mermaids"--in reality manatees--and described them as "not half as beautiful as they are painted." Certainly many mermaid sightings may be attributed to these sea cows, but as they are primarily warm water animals it is unlikely that European and Canadian sightings can be explained in this way. Thanks for the link! Unfortunately they only have articles through 1910 online.